Cantolopera Collection. Composed by Various Artists. 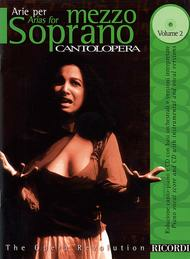 Cantolopera Series. Play Along. Collection and Performance/Accompaniment CD. Composed 2002. Ricordi #NR 13890400. Published by Ricordi (HL.50484918). Cantolopera is an exceptional new series of book/CD packs from Ricordi that offers a fresh approach to great opera repertoire. The books include versions for voice and piano of the world's most famous arias. The CDs feature two versions of each aria: one with a 130-piece orchestra providing accompaniments to allow the professional, student or opera fan to practice, and another sung by an established artist for reference. Each volume contains the lyrics of the arias, plus a short plot summary and background information on the orchestra and the performers.